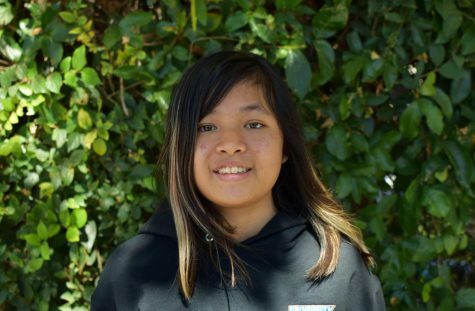 Jenica Pham is a freshman in her first year at UPA and in journalism. If she were an ice cream or a color, she would be sorbet or dark blue, respectively. She wants to eventually be a character designer in a video game company, and if she met an animation designer, YouTuber or K-pop idol, she would like to chill with them over tea. Her ideal vacation would be in a temperate forest, and Jenica prefers rain over any other weather, but she likes to be indoors at home on a rainy day. She loves art, but it annoys her when someone asks her what she made. Jenica has a hobby of watching or reading TV shows, movies, games and comics. She speaks English and a bit of Vietnamese, and has three fish and a parakeet named Alice. Tea, books and coffee are her favorite smells, and she enjoys art and merch stores. She would rather use Instagram than Snapchat and will readily drink any green, black or fruit tea from Starbucks, along with a croissant or lemon bread. When Jenica plays or watches anything, the soundtracks get stuck in her head, and she would happily buy them if she could.